West Creek Reservation is a 324-acre natural park surrounded by residential neighborhoods and leased to Cleveland Metroparks by the City of Parma and West Creek Conservancy. Staffed, operated, and maintained by Cleveland Metroparks, the Reservation reflects the wishes of Parma residents who voted to preserve the natural character of their public parkland with its hills, valley, meadow, woodlands, and creek. It remains the home of a variety of trees, plants, birds, animals, amphibians and insects. Motorists are sometimes surprised to learn they can drive to—but not through—West Creek Reservation; the entrance road simply leads to the new Watershed Stewardship Center. Trails, bridges, benches, and shelters accommodate walkers, runners, bikers and picnickers. Visitors find a quiet and friendly natural environment where they can escape to enjoy, unwind, reflect and perhaps reconnect with childhood memories. Young children delight in finding opportunities for leisurely exploration and discovery—some adults do too. West Creek Reservation reflects the vision of Dave Vasarhelyi, who as a young boy had regularly played along the woodland creek. But alarmed when that natural woodland was later threatened with development in 1997, Dave recruited a small grass-roots group of concerned citizens. Following a successful initiative petition by West Creek Preservation Committee, now renamed West Creek Conservancy (WCC), residents blocked development plans with a 72 percent voter majority, effectively preserving the original 160 acres of public land. WCC then worked to enlarge the park site under the committed leadership of Dave Vasarhelyi, Dave Lincheck, and Jeff Lennartz—all leaders of the original grass-roots group. Located in Parma at 2277 West Ridgewood Drive, just west of Broadview Road, the entrance to West Creek Reservation leads visitors to the Watershed Stewardship Center where West Creek Conservancy shares in a unique mission with Cleveland Metroparks and Northeast Ohio Regional Sewer District. Since its opening in 2013, visitors have found that this Center is different. Its focus is on water—on our freshwater—where it comes from, where it goes, what we do with it along the way, and why it all matters . . . a lot. Everyone lives in a watershed, the area where all rainwater flows down into the same creek, and then river, and then lake. The West Creek watershed is part of the Cuyahoga River watershed, which is part of the Lake Erie Watershed, a part of the Great Lakes watershed. The volume and condition of stormwater surging out of a watershed creek or sewer reflects what has happened, or has not happened, to the rainwater that fell upstream. When development eliminates those natural green areas that once absorbed and filtered stormwater, the result is downstream flooding, erosion, and pollution. 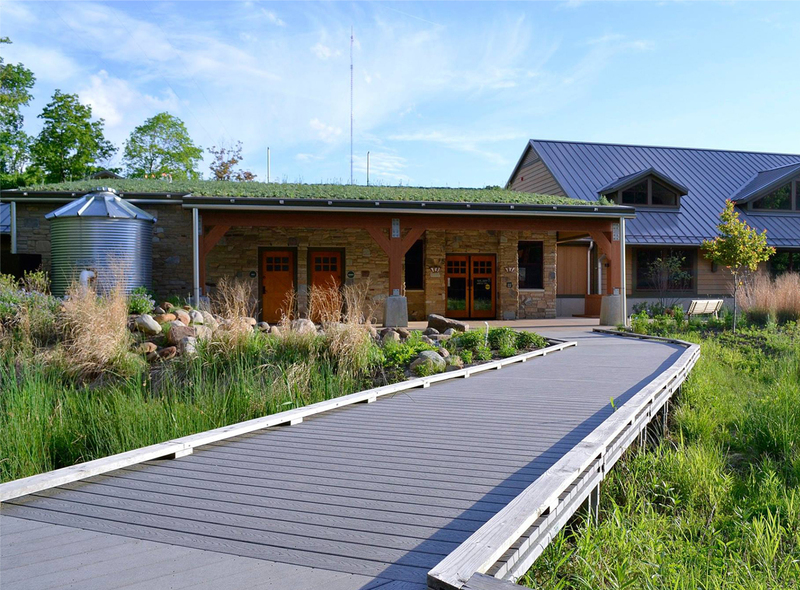 The West Creek Watershed Stewardship Center is a living classroom and laboratory for studying and resolving these problems. Interactive displays and programs teach residents dozens of stormwater management practices available for their own property. Laboratory facilities enable students and scientists to examine and evaluate opportunities for urban watershed enhancement. A large computerized interactive topographic map of the West Creek watershed both depicts and explains how a watershed works. Gardens, pools, and wetlands surrounding the Center demonstrate how stormwater can be diverted and delayed, relieving the pressure on creeks and sewer systems that are increasingly overloaded with upstream runoff from roofs, roads, parking areas and commercial development. Lessons illustrated and learned at the Center are applicable for all watersheds. What we do to the land determines what we have done to the water. West Creek Reservation resulted from a 2006 West Creek Conservancy (WCC) partnership with the City of Parma, and Cleveland Metroparks. The Northeast Ohio Regional Sewer District (NEORSD), Cleveland Metroparks and WCC were collaborators in the 2013 creation and staffing of the Watershed Stewardship Center where WCC Executive Director Derek Schafer shares on-site offices with NEORSD, Cleveland Metroparks, and Gayle Albers who manages the Center. Give a young child a neighborhood woodland creek to explore—and then watch what happens. Sometimes just one small child can make a really big difference.